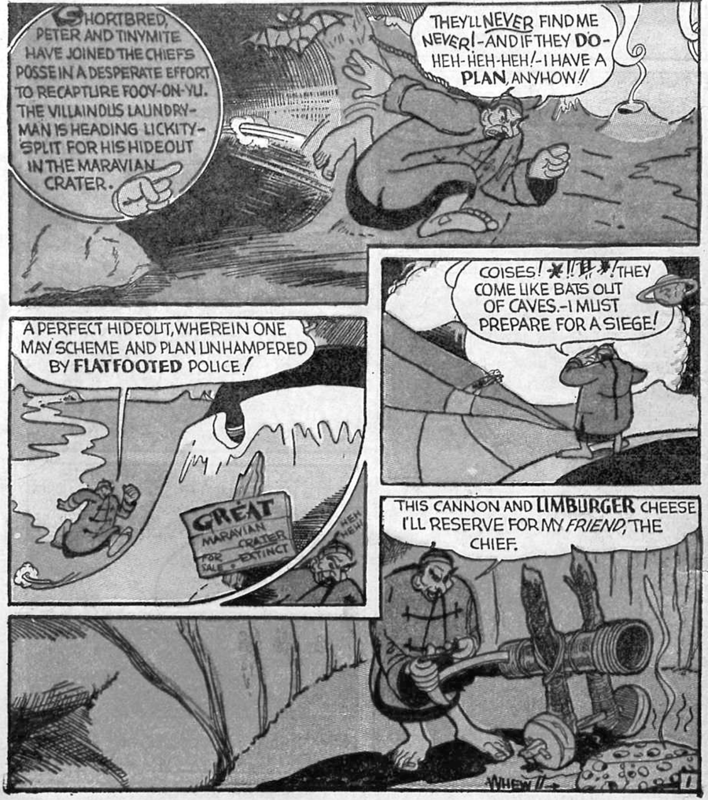 We’ve now seen a total of 18 strips from the Scrappy newspaper strip, done circa 1937 by the Eisner/Iger studio. (Here they are: part one, part two, and part three.) There’s more to come before I run out of strips to share with you. But let’s take a break to consider a burning question: who drew these? We can cross one name off the list without even thinking about it, and it’s the only one on the strip: Charles Mintz. After that, things get tricky. I’m working under the assumption that the strip was drawn by someone under the employ of Eisner & Iger Associates. In theory, it could have been produced by the Mintz Studio, but it doesn’t have that much of an animation feel and doesn’t seem to have been done by anyone who was terribly comfortable drawing Scrappy, Margy, and Yippy. I think there were actually multiple someones involved. The first strip is strikingly more polished than later ones, and the word balloons are in a different style. It’s also possible that multiple collaborators worked to pull together later strips. And I don’t have a clue whether whoever worked on the art was also involved in the story. Argument he might have drawn the Scrappy strip: mostly the fact that he was the co-proprietor of the company behind it. The evidence, pro or con: Eisner is, of course, most famous for comics that mixed adventure and drama with a pretty generous dollop of humor–but not for humor comics per se. However, his earliest work had a higher bigfoot quotient, which he eventually outgrew. The notion of him doing a humor/adventure continuity such as Scrappy isn’t inherently unlikely. The bottom line: None of these examples of Eisner being cartoony look all that much like the Scrappy strip to me. Then again, they date from a couple of years or so before the Scrappy strips were apparently done. Eisner was rapidly getting better at the time. 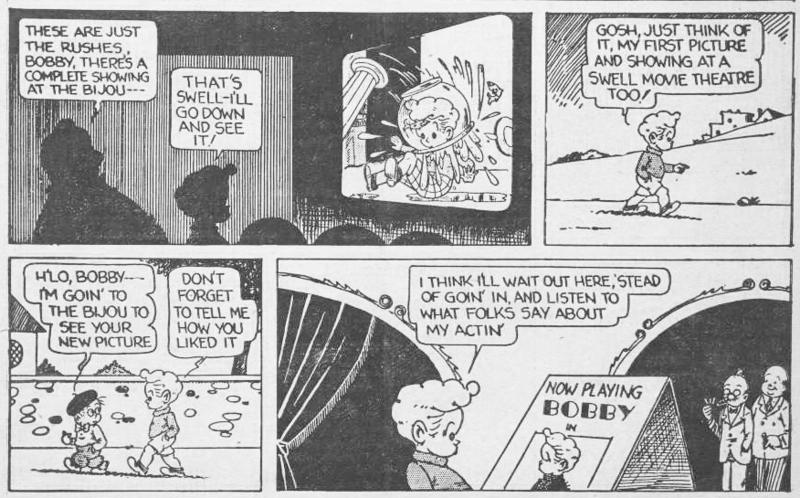 And whoever did draw Scrappy may have been making a (not particularly successful) attempt to give the strip an animation feel. Basically, I’m not quite ready to declare that it’s obvious that Eisner didn’t have anything to do with the Scrappy art–but I don’t see any clear evidence that he did, either. Argument he might have drawn the Scrappy strip: He was the co-owner of Eisner/Iger, and, as a cartoonist, had a specialty: comics about little kids. The evidence, pro or con: Iger was more than decade older than Eisner, and by the late 1930s, his style seems to have settled. Here’s a snippet of Bobby which is very, very representative of his work. The bottom line: This is stiff, static stuff. If anything, it looks even less like Scrappy than early Eisner does. Argument he might have drawn the Scrappy strip: Before he gained fame for Batman, young Kane worked for Eisner/Iger and was a humor specialist, best known for a creation called Peter Pupp, featured in Fiction House’s Jumbo Comics. It was a funny-animal adventure strip in the mold of Floyd Gottfredson’s Mickey Mouse. That might have made Kane the most obvious candidate in the shop to tackle Scrappy, which, in the Eisner/Iger version, also has a strong Gottfredsonesque tinge. The bottom line: You know what? None of the Peter Pupps I’ve seen, with or without Bob Kane’s signature, look so much like Scrappy that I think that they were drawn by the same person. Three logical candidates; no overwhelming reason to think they drew Scrappy. I’m sorry that I didn’t have the chance to ask Will Eisner about it; I first learned that the strip existed a couple of years after he passed away. I’m going to continue to research this topic–and would welcome any information or guesses you might have. 3 comments to Who Drew the Scrappy Strip? 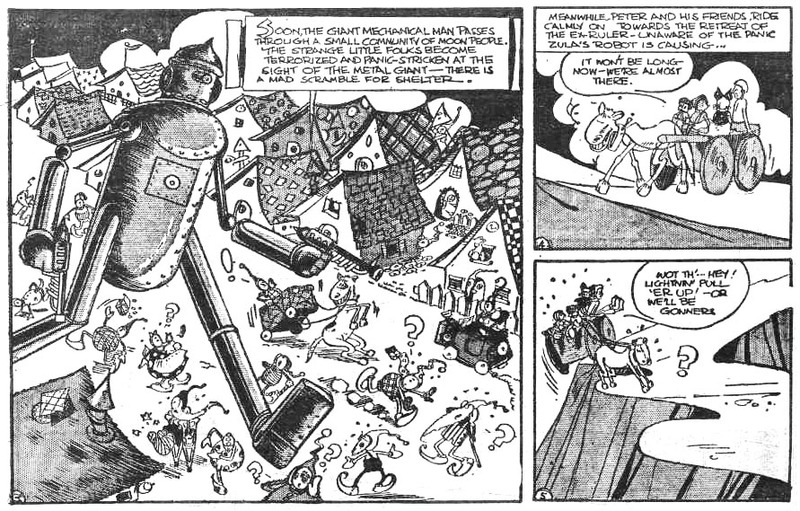 I recently found on the digital comics museum, that Jerry Igner drew the shorty shortcake comic strip. So this shows that Jerry Igner drew the scrappy comic strip, and that he could copy it for shorty shortcake. Hi, Jason. Where did you see that Iger drew Shorty Shortcake and what is the evidence? I’m willing to believe it if shown compelling proof–and Shorty Shortcake was clearly drawn by multiple people over its run–but the art I’ve seen that’s signed by Iger doesn’t look much like the Scrappy strip.